Through Week 9 of the NFL regular season, the cream of the crop on the interior of the defensive line has been made apparent. Here we look at the top-performing big men on the interior in two PFF Elite signature stats. Pass rush productivity or “PRP” measures the amount of quarterback pressure a player gets on a per-snap basis with a weighting towards sacks. Donald has been at the top of the game for the past three seasons and if the season ended today not only would Donald have put up a career-year, his 15.4 PRP would rank first all-time in the PFF era for an interior defender. Despite missing a game to start the season, Donald has a sizable lead in total pressures among his position group with 44. Picking up right where he left off in 2016, Atkins has been his disruptive self, anchoring a Bengals pass-rush that leads the NFL in pressure rate at 43 percent, racking up 38 pressures, five of which are sacks. After missing the first four weeks of the season with a suspension, Irving has been on a tear, racking up 16 total pressures including six sacks on just 107 pass-rush snaps. His performance has in part led to a good start for a Cowboys defense that was expected to struggle. Even though his season ended prematurely due to an injury, the Redskins must feel good about what they have in Allen, who as a rookie ranked among the league leaders in PRP positionally with a mark of 12.0. In limited opportunity, he put up 16 pressures including three sacks. Heyward has taken a giant step forward with his pass-rush ability this season and is currently crushing his previous career-high PRP of 8.5 with a mark of 11.7. Heyward has been disruptive all season rushing the passer and ranks second in sacks with six and third in pressures with 36. 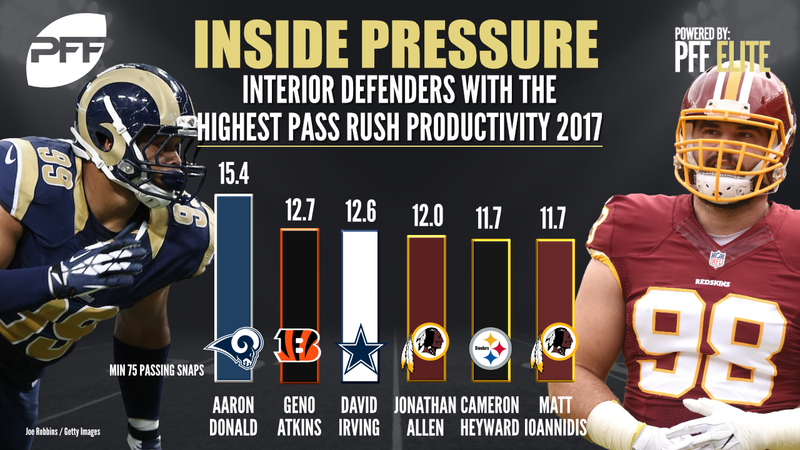 The Redskins fifth-round pick in 2016, Ioannidis has come out of nowhere to produce a huge pass-rush spark from the inside. His pass-rush grade of 82.7 ranks him just outside of the top-10 for interior defenders. He’s converted nearly one third of his 22 pressures into hits or sacks on the quarterback. Run stop percentage measures the amount of stops a defender makes in run defense relative to the amount of snaps played. A “stop” constitutes a loss for the offense. In the midst of a career year, Williams has been elite defending the run. His 15.2 run stop percentage is the top mark in the league. 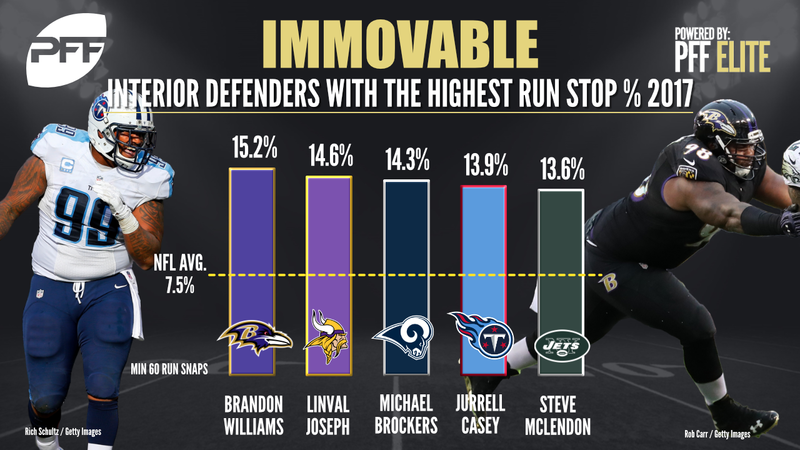 He has produced 12 run stops on just 79 run defense snaps. Anchoring the middle of a defense that allows the fewest forced missed tackles (nine percent), second fewest yards after contact (2.2), and second fewest percentage of explosive runs (two percent), Joseph has been dominant defending the run this season. His 21 run stops lead the NFL while his run defense grade of 91.4 ranks third positionally. Brockers’ play against the run has been the perfect complement to teammate Aaron Donald’s interior pass-rush ability. His run defense grade of 90.3 ranks fourth among interior defenders. He’s racked up 18 run stops on 128 run defense snaps and has recorded at least one stop in every game this season. This season, the Titans defense is allowing just 3.5 yards per carry and have been the best defense at limiting explosive runs allowing just one percent of run plays to go for 15 or more yards and Casey’s play has been a huge factor why. His 19 run stops are tied for third-most in the league. McLendon has been a big bright spot on a Jets defense who has been ineffective against the run at times this season. 17 of his 18 tackles in run defense have been stops and he has missed just one tackle so far.